earlier this year, motiv delivered their assemblies based on these drawings to begin integration onto the rover. in 2020, they will join the wright brothers’ wrapping paper sketches and katherine johnson’s brilliant calculations as examples of the pencil’s ability to help us reach the sky, space and beyond. 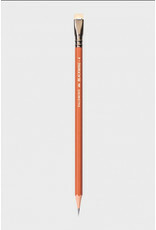 the blackwing 4 is a tribute to mars and the upcoming rover mission. it features a rust-colored lacquer and sand-textured finish inspired by the surface of the fourth planet. it also features blackwing's first ever bronze ferrule, a cream imprint and eraser, and soft graphite.